Rick Norsigian purchased a box of old glass negatives and other photographic paraphernalia. Rick actually paid $45.00 for the entire box, according to the woman who sold it to him, Lesa Schwartz. He puzzled over who might have taken the images and then lit on Ansel Adams as a strong possibility, despite what I had told him when he and I met in 2002. Norsigian was coming into the middle of a longer story, which he ignored, focusing on the potential for profit if this box of old materials could have been produced by a famous man whose work was highly valued and praised. 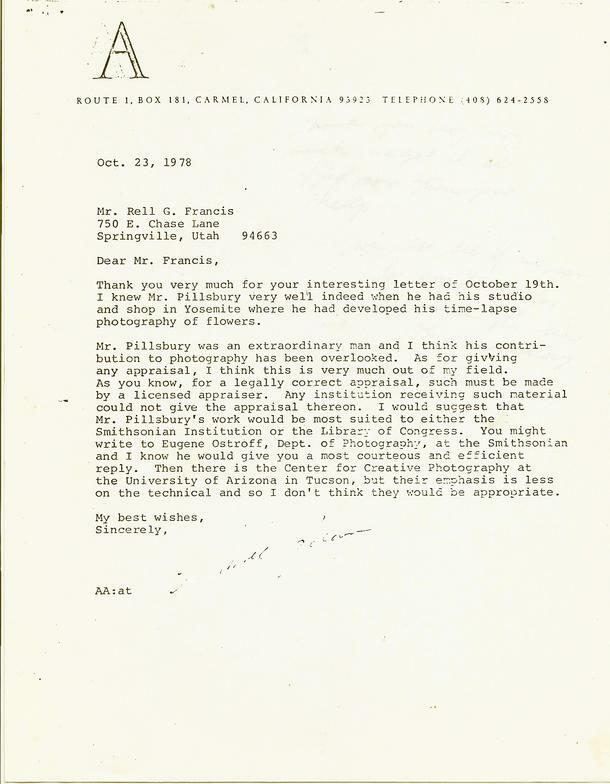 The next letter is one written by Ansel Adams October 23, 1978 in response to a letter received from Rell G. Francis. 1978 is a pivotal time in this story. The Rell letter leads to another crack in continuing disinformation campaign still going on and, in this instance, run by Ansel and Virginia Adams. The next letter below was written in 2008 and offers an opportunity to the Adams family to come clean. They ignored the letter entirely. The Norsigian conflict was yet to erupt, though I had over the years managed, single-handed, to find much more proof of what had taken place with the help of others, especially, Charlotte Kielyka, who handled photographic forensics for the Arthur C. Pillsbury Foundation, beginning at that time.